I need to do a post on annoying questions/things people say to pregnant women. Really. Because I have good (snarky) replies to most of them. Size of baby: McLittle is now the size of a sweet potato. This, of course, is all relative, seeing how sweet potatoes vary in size. Total Weight Gain/Loss: I’ve gained about 14 pounds since mid-December. Gender: We’ll know this time next week! Movement: Not really feeling anything. Sleep: Since I started taking the iron supplements, I haven’t been exhausted! My sleep at night continues to be great. What I miss: Still doing things for myself, like lifting things at Lowes. And doing my own yard work. Cravings: Pineapple. I’ve figured out that canned (Dole!) pineapple is a great substitute for fresh pineapple. Now, if someone can just explain that to my husband who accidentally bought Del Monte. I ate it (and didn’t complain), but I’m going to do the shopping this weekend. Symptoms: We’ll test out the car sickness this weekend. Other than that, I’ve felt great and (mostly) normal. Best moment this week: I’ve been outside a lot this week. I’ve loved working with the flowers in my yard – and I know I’m going to miss that this summer when it’s too hot to sit outside. I really need to work on these photos, and put a little more effort into them. Or maybe have my husband take more than one picture before running out of the house. (I forced him to take the picture as he was trying to leave this morning – it may be replaced this evening with a better photo.) Also? This shirt doesn’t do much for me. It’s one of the more flowing shirts I’ve been wearing. One more thing. 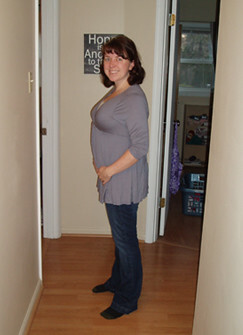 These are my regular pre-pregnancy jeans. All buttoned and zipped on their own. That makes me very happy! stinkin.adorable! love the shirt too! i need you to fill me in on some on the snarky responses…i could have used one yesterday at the lab. Snarky responses are great! Please share. One of my favorite questions after my twins were born: Are they identical? Um, one is in a dress and bald, the other is in boy clothes and has a full head of hair. The best response came from my FIL: They will be after the operation! Bari, I’m constantly amazed at the questions people ask. Jaime you look great and I’m glad you feeling pretty good. Good luck on your spring break car trip. Also? With my first she was about 6 months old and I had her in a pink dress (which was unusual), she was bald, but had pretty little earrings in and I had some little old lady come up to me say what an adorable little boy I had. You must learn to just let those comments slide and then later laugh at their absurdity.